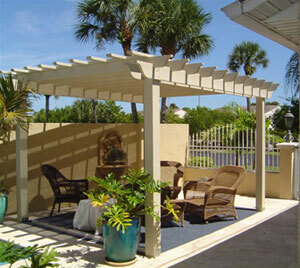 Viking Fence And Deck : Serving Melbourne, Cocoa Beach, Merritt Island, Rockledge and Brevard County in Florida. Viking Fence and Deck, a company founded by Richard (Rick) Monachello, has been building quality fences and decks since 1979. Over the years, the company has grown from a one-man operation, to a corporation that has over 80 years of combined experience building fences and decks as well as sidelines of arbors, trellises, railings, benches, retaining walls, etc. Choosing a fence or deck company is an important decision. At Viking, we are committed to complete customer satisfaction and giving you, the customer, a product that will endure over the years as well as add value to your real estate. We believe in using the best quality building material, fasteners and hardware. Quality components and constantly evolving construction techniques ensure that your fence and deck will be trouble free for many years to come. In decking, we offer a variety of materials and have the expertise to work with you to build the custom deck you’re looking for. We specialize in composite wood and exotic hard wood that will give you a lifetime of carefree use. The staff in Viking’s fence department is knowledgeable in a full range of types and styles of fence. Wood, vinyl, ornamental aluminum, or chain link, we have professional installers who can meet the most extreme challenge. Now offering custom made vinyl sign boards add the sign of your choice in various color and style options. Quality Virgin Vinyl, built to order. Serving Melbourne, Cocoa Beach, Merritt Island, Rockledge, Palm Bay and Brevard County in Florida. 1.) You talk directly with a local person, not an out of state phone answering service. 2.) Prompt estimate response sometimes within hours of your call we know that when you call you don’t want to wait a week for your estimate. 3.) A wide variety of deck & fence materials to fit your budget and needs. From affordable pressure treated pine to vinyl, composite, or even exotic hardwoods. 4.) A family run business for 30 years with focus on quality and customer satisfaction. 5.) A BBB member for more than 20 years with a flawless reputation. 6.) Stamped engineered drawings (when required) for maximum support during hurricanes. Viking has had a multitude of jobs up & down the coast that showed no signs of damage from hurricanes Francis or Jean. 7.) We will help you network other trades like landscaping, concrete work, screen rooms, thatch or metal roofs for our gazebos, bamboo furniture, built in pools, above ground pools, tropical interiors, and any kind of home improvement you could possibly think of. 8.) We try to get away from the boring 10 x10 deck and add variety and distinctive design to your outdoor living project. 9.) At Viking we are not content to install new decking on old frames or new fence on old post. When we inspect your job we start from the ground up making sure your foundation is up to our standards, most of the time it is not. 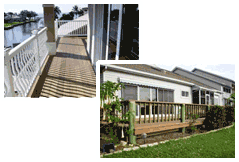 Sure a repair might be cheaper but to repair a wood deck or fence is not cost effective. We don’t always say what you want hear, it’s our job to teach you about keeping the job at a quality standard. ©2019 Fencl Web Design of Florida and its licensors. All Rights Reserved.